5S is a systematic form of visual management utilizing everything from floor tape to operations manuals. It is not just about cleanliness or organization; it is also about maximizing efficiency and profit. 5S is a framework that emphasizes the use of a specific mindset and tools to create efficiency and value. It involves observing, analyzing, collaborating, and searching for waste and also involves the practice of removing waste. 5S includes five terms that all start with the letter "S."
5S, sometimes referred to as 5s or Five S, refers to five Japanese terms used to describe the steps of the 5S system of visual management. Each term starts with an S. In Japanese, the five S's are Seiri, Seiton, Seiso, Seiketsu, and Shitsuke. In English, the five S's are translated as Sort, Set in Order, Shine, Standardize, and Sustain. Seiton Set in Order Ensure that all items are organized and each item has a designated place. Organize all the items left in the workplace in a logical way so they make tasks easier for workers to complete. This often involves placing items in ergonomic locations where people will not need to bend or make extra movements to reach them. Seiso Shine Proactive efforts to keep workplace areas clean and orderly to ensure purpose-driven work. This means cleaning and maintaining the newly organized workspace. It can involve routine tasks such as mopping, dusting, etc. or performing maintenance on machinery, tools, and other equipment. Shitsuke Sustain Sustain new practices and conduct audits to maintain discipline. This means the previous four S's must be continued over time. This is achieved by developing a sense of self-discipline in employees who will participate in 5S. The 5S methodology is a systematic approach to workplace organization. This method includes the five steps of Sort, Set in Order, Shine, Standardize, and Sustain. Generally speaking, the steps of 5S involve going through items in a workspace, removing what's unnecessary, organizing items, cleaning, performing maintenance, and making sure these things become habits. These steps should occur in this order, and there must be a plan in place for performing the tasks associated with these steps on a regular basis. At the end of of a 5S implementation you will see characteristic things such as policy manuals, glow-in-the-dark tape or photoluminescent tape on the floor, colored bins, red tags, and 5S walks taking place. In the end, it should all add up to efficiency. The 5S methodology originated in Japan and was first implemented by the Toyota Motor Corporation. The methodology was developed as a way to make just in time (JIT) manufacturing possible. This type of manufacturing intends to produce only the amount of a product that is needed, when it is needed. Having an organized workplace that utilizes visual cues to maintain itself allows JIT manufacturing to proceed more smoothly; in this type of environment, it's easier to see problems and move materials efficiently. The 5S methodology traces its lineage to post-war Japan, where the leaders of a burgeoning Toyota Industries (neé Toyoda Automatic Loom Works) were seeking to reduce manufacturing waste and inefficiencies. Their solution, dubbed the Toyota Production System, encompasses a number of methodologies that would become famous in their own right, including Just-In-Time manufacturing, Jidoka, and the core concept of the visual workplace. Initially, the Toyota Production System was a closely-guarded secret, but the massive economic boom Japan experienced in the 1980s drew intense interest from foreign corporations wondering how Toyota, the shiniest jewel in Japan's manufacturing crown, was able to build so many products, so quickly, at such a high quality level. As a gradual, international exchange of ideas began to take shape, author and ULVAC Inc. executive Hiroyuki Hirano devised the five pillars of the visual workplace, a concept that would metamorphose into the 5S methodology as we know it today. The 5S methodology is a system for handling workplace organization. It includes 5 steps known as the 5 S's that turn organization into a step-by-step system for people to follow. This methodology is often considered the foundation of Lean manufacturing because for a workplace to reduce waste and become more efficient, it needs to first be organized. What is the purpose of 5S? The purpose of 5S is to make a workplace function better by making it an easier place to work. This occurs by making spaces make sense; tools and materials are placed in logical locations based on who needs them, how frequently they're needed, etc. Spaces are cleaned regularly. Cleaning and organization become habits. When used correctly, 5S ultimately makes processes safer and more efficient. 5S stands for the 5 steps of this methodology: Sort, Set in Order, Shine, Standardize, Sustain. These steps involve going through everything in a space, deciding what's necessary and what isn't, putting things in order, cleaning, and setting up procedures for performing these tasks on a regular basis. When there's a plan for making 5S an ongoing effort and not just a one-time event, it can be sustained over time. The 6th S stands for Safety. Some businesses choose to add this step at the end of 5S to ensure safety is a key component of work practices. Other businesses believe safety should be a part of all the steps of 5S and therefore doesn't need to be its own step. Either way, safety does play a role in 5S. Arranging spaces in logical ways, organizing tools and materials, and cleaning regularly make it easier for people to do their jobs without tripping, slipping, experiencing an ergonomic injury, etc. How does 5S relate to kaizen? Kaizen is a Lean manufacturing concept that refers to the ongoing process of "continuous improvement." Kaizen seeks to find small ways to improve processes over time. For kaizen to work well, everyone in a workplace participates by looking for ways their tasks could be improved. The goal of 5S is also to improve processes. It does so by increasing organization and efficiency. This means 5S sets a workplace up well to use kaizen. Once an organizational system exists, people can more easily look for improvement opportunities. Lean, often called Lean manufacturing, is a method used to identify and eliminate waste from a manufacturing process. Lean aims to remove anything from the production process that does not add value to the end product or service the customer purchases. The Lean manufacturing principles of eliminating waste and streamlining processes originated with the manufacturing industry in Japan in the mid-twentieth century, and in the late twentieth century grew popular with American businesses. 5S is a Lean manufacturing tool that serves as the foundation for all other Lean endeavors. 5S creates a visual logic in the workplace and puts things in order so waste can easily be identified. The term 5S is often paired with Lean because 5S is a foundational part of Lean manufacturing. Implementing 5S in a workplace makes it easier for people to navigate, find what they need, and keep things organized. Once a sustainable 5S system is in place, other Lean manufacturing initiatives such as kanban or kaizen can be implemented more successfully because the workplace is already easy to work in. Without 5S to keep everything in order so problems are easily identifiable, other Lean efforts often see less success. In many cases, 5S is what makes the rest of Lean possible. Visual management, sometimes called visual control, is a method of managing a business that uses visual signals to communicate important information. These visuals can include diagrams, pictograms, color-coding, floor markings, photographs, and more. This type of management allows people to quickly understand the information being conveyed. In many cases, visual management techniques make it possible for everyone in the workplace to understand the current state of work processes. For example, a green andon light shows a process is moving smoothly, while a red light calls attention to a problem with a process. 5S is a form of visual control that focuses on organization and can improve productivity. Visual markings in a storage area can help workers return materials to their proper locations, floor markings can create boundaries around work cells, and signs on the floor can point out the proper locations for trash and recycling bins. Using visual tools like these allows a business to communicate information to workers without needing to actually say anything. A visual workplace is a workspace where visual tools provide people with the information they need to complete their work. These visuals explain the workplace so people do not need to ask unnecessary questions. A visual workplace is often described as being "self-explaining, self-ordering, self-regulating, and self-improving" because the visual signals it uses allow it to operate with minimal extra effort from users. A workplace that uses 5S is often called a visual workplace because 5S is a method for making an organizational system visual. 5S is a sub-part of the entire Lean philosophy. 5S is simple to start and shows the value of Lean. 5S is easily recognizable by both employees and members of higher management. 5S is a component of visual control, which can: recognize operational efficiency, create opportunities for abnormality detection, build specific behaviors and discipline, and promote new culture. When a plan/vision is in place, employees know how to be effective and are able to work towards higher levels of efficiency. 5S creates better problem-solving skills and improves employee morale and employee engagement. 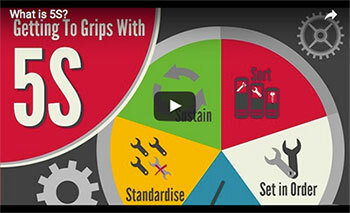 5S aids in decreasing the number of workplace injuries. Employee involvement is an absolute must for successful 5S implementation. In fact, many people may argue that a company simply cannot be successful in 5S without total employee involvement. Employees should be involved in nearly all stages of 5S implementation and should also be involved in all tasks involving 5S practices and/or procedures. For instance, employees should participate in the decision-making process regarding the red tagging of unneeded items. Employees should also be utilized as a valuable resource when it comes to overall organization. It is the employees who are out on the work floor each day, engaging in processes and noting both the pitfalls and peaks of each work process. Another large component of employee involvement includes education. Employees should not be expected to understand and comply with the methodologies of 5S if they do not understand them or the overall purpose. Employee buy-in plays a huge role in the success of any 5S effort. It is critical that both employees and management are educated on the value of 5S as a "tool" instead of just simply as a philosophy. When 5S is viewed as a "tool," staff will begin to believe in the processes involved, which will help promote greater levels of efficiency, quality, and staff flexibility. Redirected Labor Cost - When starting a 5S project, many hours are used to help promote employee buy-in, discuss pitfalls and barriers, create a plan of action, etc. These hours of lost production are simply the "nature of the beast" so to speak and may easily be recouped once 5S processes have been established and plans are carried out. This is most easily looked at as a small donation, which will yield large results. Materials and Goods Costs - Many different types of materials and goods may need to be purchased and/or ordered to help make 5S a success. Some of these products may include, but are not limited to: floor tape, industrial label printers, foam tool organizers, shadow boards, shelving units, and whiteboards for warehouse mapping. Starting any project that involves the potential for large changes can be somewhat daunting. However, there are a few ways to help establish a rich soil for abundant levels of growth. Providing examples and a framework for success. Allowing employees to discuss the potential barriers and pitfalls of the recommendations. Providing insight about how the process will actually operate to help alleviate some of the unknowns that could hinder the process. Throughout the employee buy-in process, many teams will show excitement and interest when it comes to discussing the pitfalls and barriers associated with the new changes. However, as this is done and details are hashed out, great insight and information with be gathered on how to best approach the team in the future. When pitfalls and barriers are met with a positive mental attitude, even some of the most intimidating tasks can be conquered. It is important to remember that positive attitudes are contagious. The 5S system of visual management has improved organization and efficiency in many workplaces including manufacturing environments and offices. This system consists of five pillars—Sort, Set in Order, Shine, Standardize, Sustain—that make maintaining the workplace in good condition a visual process. Employees throughout an organization must contribute to the system by performing routine housekeeping tasks throughout their workdays. Thinking of 5S as a system—rather than just an initiative a business is trying out—can help make it sustainable. 5S becomes part of work processes rather than something separate. It changes the way the workplace is organized and it can change the way work is performed. In a 5S system, employees perform 5S tasks as part of their regular work. Many businesses decide to implement a 5S program as a way to standardize procedures, increase orderliness, and improve efficiency. Generally, having a team design and implement a program is effective because people from different parts of the business bring unique perspectives. Using a team also removes the burden of starting and maintaining 5S—which can be a large project, especially in large organizations—from one person. The team will be responsible for tailoring 5S to the needs of the workplace. Each 5S program will feature visuals best suited to the work environment and its employees. For example, a program could use floor markings that divide work areas from storage areas or shadow boards that highlight where tools should be stored. A 5S program should also assign specific responsibilities to employees such as cleaning a work surface daily or making sure all tools have been returned to the storage area at the end of a shift. This framework can be adjusted over time to improve the program based on feedback from people in the organization. Employees at all levels of an organization must receive adequate training in 5S for the system to be effective. This includes upper management, supervisors, maintenance staff, and employees on the floor. In 5S, everyone is responsible for doing his or her part to maintain the system, and this occurs in workplaces where people understand the thinking behind 5S, not just the steps and tasks they must perform. 5S training should explain the pillars of 5S, its applications in the workplace, how 5S fits in with the company's goals, and what role each person will play in maintaining an effective 5S workplace. A Lean mindset should be established before even starting the processes of 5S. Accountability along with setting expectations is vital. What is expected and who and what will benefit from the changes? When creating a plan, it is most helpful to start out with an actual business case or reason for the changes to be made. How will the improvement affect or benefit the bottom line? For instance, is there time being wasted searching for something? Or is there a lack of organization or a need for visual management? Pinpoint some of the most relevant needs in the particular work environment. It is important to avoid trying to get the best Standard Operating Practices (SOPs) immediately. Likewise, it is also just as important not to impose specific SOPs on the teams. When employees are forced into doing something without being asked for input or thoughts, the first natural reaction is to actually resist the change. "Use the SDCA cycle (Standardize the work/Do the work to the standard/Check the work/Act to re-standardize) to tighten down the SOP's to get to best practice. In this way the teams own & self-manage the standards." The team involved in doing the 5S tasks should include the members who actually work in the specific area. For instance, it would not make very much sense to take a team of office employees out onto the industrial work floor to implement all the 5S changes needed. The team working in the area should always be involved in the changes and improvements being made and/or considered for that specific area. Shadow boards can be a helpful tool when implementing and sustaining the processes of 5S. Shadow boards feature an outline of where tools belong and allow employees to quickly identify which tools are missing. Shadow boards help with both tool organization and tool accountability. Floor markings are a staple within many well-organized workspaces. Floor markings can be used for a variety of different organizational purposes from delineating a specific workspace to marking off pallet storage or even for helping pedestrian traffic navigate to safe areas within the work environment. Floor markings are extremely diverse tools and are available in a variety of different colors, sizes, strengths, thicknesses, and even shapes. Floor markings such as tape and shapes are helpful tools in many different types of work environments such as offices, auto shops, healthcare facilities, manufacturing facilities, retail environments, etc. The use of signage in an efficiently run work environment is essential. Not only does signage help increase safety, it also creates a visual environment for employees to thrive in. Safety signs can be found in a variety of colors, shapes, and sizes and can be found with many different common text combinations. In addition, it is even possible to create customized signage to meet any unique marking needs. Signage may be available as floor signs, wall signs, or standing signs. All signs can improve visual communication. Labeling is a big component of efficient organization for a 5S system. Virtually anything can be labeled to help keep work areas organized, efficient, and visual to employees. For instance, some things that can be labeled are shelving, storage units, bins, workspaces, pipes, etc. When labels are used strategically, employees understand where things belong and can easily identify when something is missing. Industrial printers assist in making printing easy, convenient, and cost-effective. Instead of having to order labels from an outside entity, labels can be printed right in-house with the help of an industrial label printer. Industrial label printers are capable of printing an assortment of different sized labels using different colored inks and can print on different types of label supply as well. Some industrial label printers even feature thermal print heads that can create an extremely durable, no-smudge label. 5S Tags, also known as "red tags," are commonly used during the Sort phase of 5S. These tags are attached to items that no longer add value to the work facility and are not often needed or used. This type of red 5S tag is easy to see and makes the process of sorting through different tools, supplies, and equipment simple and straightforward. By looking at the tags, employees can easily determine what is going to stay and what is going to go. "I was teaching 5S at a supplier and while on the line, I asked what the purpose was for a certain machine (an inline nitrogen system). The supervisor said it was critical to production and needed to stay. I pointed out that the pipes connecting it to the line were cut and that it had an inch of dust on it. We found out they had not used it in years and they were able to sell it for around $100k. In another Kaizen we had a centerless grinder with high variation. It was enclosed in a cabinet so the only point at which they knew the part was bad was after the process. The area was filthy, so we made the entire group stop and just clean for an entire day. After taking years of grease off the machine, we found two things, first, the machine was actually green, not black, and secondly there was a window where the operator could see the defect occurring." After launch of league 5S, condition of 5S was improving from month to month. There are many details that Lean Coordinator must follow to keep league 5S alive and well running. 3 basic rules are: TRAINING, WELL INFORMED EMPLOYEES and PROPER AWARDING SYSTEM. For more info don't hesitate to contact me." Most people working for any type of warehouse or manufacturing company will recognize the term 5S and immediately know it is all about reducing waste and improving productivity. However, in addition to 5S, there is also a sixth S known as safety. While the sixth S is not a part of the original Lean concept developed at Toyota, the implementation of it can help improve productivity and eliminate waste in many ways. Throughout the Lean manufacturing community there is some controversy about whether 6S should be a standard or not. The argument against 6S points out that safety should be a key component of each of the other S's, and therefore having a 6th separate S is actually redundant. Nonetheless, those who like the idea of 6S believe that while safety should be a factor in each of the other S's, it is important enough to warrant its own category as well. There really is no right or wrong answer, but it is difficult to argue that safety is not one of the most important factors in reducing waste and improving productivity. Accidents Waste Time – When there is an accident in a facility, it is typically necessary to halt work while it is investigated. Depending on the severity of the accident, this can cause a work stoppage for hours or even days. Obviously this is very inefficient. Improving safety will reduce the number of accidents, which will then improve productivity. Injuries Slow Work – When someone is injured at work, they will likely have to take some time off to recover. It may be necessary to bring someone new into the facility, which will cost time and money. In addition, any workers' compensation that needs to be paid out could be considered wasted money also. Even once the employee returns, he or she may never be as efficient again due to the lasting effects of the injury. Safety Improves Organization – Many safety improvements can help a facility stay more organized, which improves efficiency. For example, if floor marking tape is used to divide up aisles into driving and walking paths, everyone will know where they need to be. This may allow people to travel faster, which in turn improves productivity. Employee Confidence – Employees who work in a hazardous environment are more likely to do things slowly to help protect themselves. When employees feel confident that the facility is a safe place to work, they can move at a faster pace and get the work done properly and in a timely manner. OSHA Inspections – If a work facility is found to be unsafe by OSHA, that facility is much more likely to have repeat inspections from the agency in the future. OSHA inspections, while important, do cause lapses in productivity. If safety can be improved, it is more likely to receive positive results from any inspections that do occur. Of course, there are dozens of other ways that safety can help improve the overall efficiency of a facility. Whether it is called 5S or 6S, safety should always be incorporated into every Lean efficiency effort made. One of the best ways to do this is to take a look at how all efforts with any of the first 5 S's will impact safety. Every facility will have to come up with the specifics for how this is done, but many companies have found that making a simple chart can be helpful. The chart below shows how it works and how the sixth S may be adopted into use in the work facility. Sort Keep tool benches clean using foam inserts Tools will be kept in better condition and will therefore be safer. Also reduces the risk of accidental cuts when searching for tools. Set in Order Organize warehouse shelving using labels Being able to find items in the warehouse quickly will reduce the risk of items falling or someone being injured while searching through multiple areas. Shine Perform preventative maintenance on machines Keeping machines in proper working order will help ensure they do not malfunction and cause an injury. The table above is a very simple depiction. However, it should provide an idea of how to take projects that were set for the traditional 5S steps and use them to make safety (6th S) improvements as well. 5S is a powerful tool in the workplace and can be adapted to fit into any appropriate time scale (daily, monthly, yearly, etc.) as long as ongoing support is handled correctly. Below is an in-depth exploration of each step within the 5S process and how it can be utilized to ensure maximum effectiveness. Sort is the first step in any 5S process. The term sort is originally derived from the Japanese word Seiri. Each step in the 5S process has an associated goal that can be specifically outlined to help guide efforts. For the step of Sort, the goal is to remove unnecessary items from the room, station, or space being organized. Furthermore, the sorting phase also aims to provide a clean slate on which to build and carry out the other four steps. Beginning the process of Sort starts out simply, as nearly everything should be removed from the target area. Even though taking items from one space and placing them into a big pile in another space seems like it may be making a mess, this is not true. Instead, this is the opportunity to really make decisions about what needs to stay and what needs to go so actions can be immediately taken for items that are no longer used or needed. Industrial bins are needed for an accurate sort. Based on the standard approach, there are three to four "bins" or sorting categories used when conducting a 5S sort. Keep: These are items used frequently and essential to the operation of the workplace being sorted. If the target area is a supply room, tool shed, or another area that feeds into greater business operations, employees should be evaluated on how often they draw tools from the Sort area to utilize those items. These tools should be returned to the 5S'd area after sorting is complete. Probation: Items in this pile or bin are being evaluated for use. A specific amount of time should be set (that is appropriate to your business cycle) during which items will be evaluated to see whether they are used often enough to keep. After the probationary period, these items are either discarded or organized back into the original workspace. To Move: This option is talked about less, but is still an important consideration for items that may be helpful in your business. Items that are not needed often but must be on hand for times when they are required will need to be relocated. These items will eventually find new homes in other stations or rooms that make the most sense for them. It is important to actively audit the sorting process of any 5S'd space to ensure accuracy and attentiveness. Sometimes, an emphasis on organization can overshadow other important areas; be sure to check in on tool calibration, supply expiration dates, and potential safety hazards while areas are undergoing audit organization. The second step of 5S is "Set in Order" which is derived from the Japanese term Seiton. This phase focuses on placing the items deemed essential in the Sort phase back into the workstation or area in a specific, well-organized manner. More importantly, Set in Order is truly about finding the most efficient and sensible homes for the tools and items within that area. Every time employees have to search around for a tool to complete their jobs, time is wasted and by extension, the business loses money. Setting items in order in an intentional and planned way is essential to minimizing these types of losses. For example, imagine the importance of well-organized tools for EMTs. They need to have their most frequently needed tools and equipment on hand and easily accessible to help save the lives of their patients. Logical organization paired with knowledge of where tools and supplies are could literally make the difference between life and death. While the stakes may not always be as high in a production facility, every loss of efficiency does bleed a business' profits out little by little. A good way to begin this step is to map out the area where the tools and equipment will be returned to. During this stage, it is critical to really think about the jobs being performed in or around each station. This knowledge should be used to map out the most convenient and comfortable areas for workers to go to or reach towards. Employees' most frequently used tools should reside in easy-to-access areas with the least restrictions possible. The goal is to minimize the need for employees to repeatedly reach over and between items by placing the most frequently used tools and supplies closest to the station operator, while opting to place less utilized items in other areas. One excellent tool/technique for setting a workspace in order in an efficient manner and keeping it that way is to utilize shadow boards. Shadow boards feature outlines of tools behind or beneath the locations where they hang or sit when stored. When an item is removed from its specific location, it is easy for a worker to quickly see where to put it back because of its silhouette. Shadow boarding can be easily applied to already existing surfaces and pegboards where items are kept. Personalize the placement of items. Workers are individuals and what works for one may not be the most efficient option for another. In the context of setting a workspace in order, this could mean making adjustments to where items are stored if an employee working at that station frequently is particularly tall or short. In addition, another consideration is to whether an employee is right or left handed. Accommodating for this can make reaching and maneuvering to get to tools easier, safer, and more efficient. Asking employees personally to get involved with decisions, or at the very least provide feedback on what organizational setups would make the most sense for day-to-day tasks, can make a big difference in levels of efficiency and improve the process. Stemming from the Japanese term Seiso is "Shine," which means to sweep or sanitize. This is the third stage of a 5S project. First and foremost, the Shine phase is basically a complete and unapologetic cleaning of the entire workstation or space. In this phase, employees should be cleaning, dusting, polishing, sweeping, and vacuuming along with anything else needed to attain perfect order. In nearly any case, a clean workplace is a safer workplace. For instance, keeping floors clear of dust and debris helps reduce the risk of trips, slips, and falls – an extremely common cause of workplace injury. A clean workplace also helps counteract any potential infections or other health hazards employees might otherwise encounter. Simply put, workplace accidents have the potential to destroy efficiency, and a good shining can help workers avoid them. Cleaning can be used as an inspection tool. Clear expectations are necessary for positive employee interactions and, ultimately, results. When employees know what is expected of their workspace, they are more likely to keep things in that state. Posting imagery nearby that shows the fully cleaned or "shined" state of a workspace can be a helpful way to keep this communication alive even when no one is physically present to deliver it. Furthermore, an information board can even show step-by-step instructions for how certain areas or tools are meant to be cleaned at the beginning and/or the end of a shift. A regular and thorough cleaning helps prevent tool and machinery degradation. Not only does this help with safety as described above, it can also ensure these items last longer. A longer natural lifespan means less costly replacement and maintenance in the future. Be proactive, not reactive. Cleaning should always be carried out on a schedule, not in response to a workspace that has grown too cluttered to navigate efficiently. Reactive cleaning indicates a lack of cleaning already in progress and also suggests that workers are unable or unwilling to stick with the schedule. Shine is not about cleaning up messes as they arise; instead, it is more about implementing the proper cleanliness strategies to avoid making messes in the first place. Workers should take turns rotating into a supervisory role in which they are tasked with ensuring that "Shine" is up to par and done in sensible ways. This team member should be responsible for working with other members of the team on their own habits. Rotating this job helps to keep everyone happy and involved, and it also may save managers and supervisors time as they will not have to constantly carry out the task themselves. When Shine is done properly and on schedule for a certain period of time, rewarding workers with simple incentives (pizza parties, gift certificates, awards, etc.) can be an easy way to keep the positive momentum going. This can be useful when moving forward with the remaining 5S steps. Seiketsu, Japanese for "Standardize," is the fourth step in the 5S process. This stage directly connects with some of the closing tips from the "Shine" section, and that's because it builds on the idea of auditing and checking in on 5S efforts regularly. Standardization is essentially "the bridge" between Shine and the final step of 5S, Sustain. By standardizing the approach to 5S, it can ensure organizational efforts are sustained in the long run. Failing to standardize procedures can lead to work becoming sloppy over time and a loss of efficiency. Begin to standardize 5S operations by making the process more than a word-of-mouth agreement. This is the time to implement a clear, universally understood system so that employees are certain about what they are expected to do. One excellent way to do this is to design and print out 5S audit sheets that can be used by whoever is checking an area on a given day. A checklist that asks specific questions about the work area can help ensure that processes are carried out as intended. "Are all tools in their correct place on the shadow boards?" "Have power tools been unplugged with their cords properly stored?" "Are the necessary supplies in place for the next worker who will begin a shift at that station?" What Happens When Audits Don't Return the Desired Results? Inadequate employee training. Sometimes, it may just be that workers have not had effective or enough training about what is expected of them. This is especially common when not all workers were involved in the original 5S efforts. This situation can also arise from employee turnover, which can place new employees into a position where others would have had more training. In this case, new employees may find themselves unable to keep up due to lack of knowledge or practice. Lack of Time. A question to ask is, "Are current shifts and schedules allowing adequate time to complete the set 5S tasks?" Sometimes schedules along with high demands hinder the employees' abilities to complete organizational tasks after a shift. In these cases, it is important to take a step back and look into other efficiency tweaks that could allow more time for employees to complete these needed tasks. Lack of requested feedback. In the standardization process employee feedback should be collected and responded to in a timely and genuine manner. Employee suggestions should be taken to heart, especially if comments hint that something is not working properly. After all, it is the employees who are tasked with keeping things in order day after day. The final step, which is known as Sustain or Shitsuke, focuses on taking all of the previous steps of 5S, including the standardized procedures, and transforming them into ongoing habits to ensure continuous improvement. Just having a basic system in place is not enough, and the existence of the Sustain step is a testament to this. When workers are required to do something new in the workspace, it will not become an automatic habit right away; it takes people time to actually form longstanding habits. Demonstrate. Anything expected of workers should be demonstrated correctly by a trained and knowledgeable professional. This is the portion where workers gain an understanding of what actually needs to be done. Supervised undertakings. Employees need to be worked with closely so they know what is expected. In addition, employees should be monitored through their first few attempts to make sure the daily 5S habits that are being formed are the exact habits needed and desired. Workers shouldn't be coddled through this. Mistakes should be corrected. Periodic check-ins. After the initial training, it is important to stay vigilant by utilizing the auditing techniques established in the standardizing step to regularly ensure that things are running smoothly. Having employees learn to properly do these checks can be helpful for positive habit forming as well. Make changes as necessary. Sometimes continued undesired behavior or undesired results come about as a consequence of a faulty system. If this is the case, find the fault in the original setup and correct it as necessary. When existing employees help train new employees, it helps refresh the tactics and practices of 5S. Thank you Marine Engineering Training for this photo. When a new employee joins a team that uses 5S, one of the best things to do is let current employees carry out the new employee's training. Teaching someone else how to accomplish a task requires one to evaluate his or her own knowledge, and workers can easily spot gaps that they may have questions about. Doing this also helps reinforce the ideas they are teaching, especially if workers have grown sloppy over time or deviated from the original expectations. Measure, don't just guess. Sustaining is about making adequate progress. The ultimate goal of 5S is to increase efficiency. The actual organizational steps taken on the way are components of this goal and shouldn't overshadow the larger endeavor. It is imperative to keep accurate tabs on whether or not the 5S effort has helped workers cut down on production times, accident rates, missing equipment costs, etc. over time. Use actual numbers and do not overlook the facts, even if they are not as impressive as hoped for. Properly sustaining 5S is about carrying out the task or concept time and time again until it becomes second nature. This can be a frustrating phase for both managers and employees, so it is important to ensure communication is open, factual, and constructive, while being free of accusations. 5S originated in manufacturing environments. 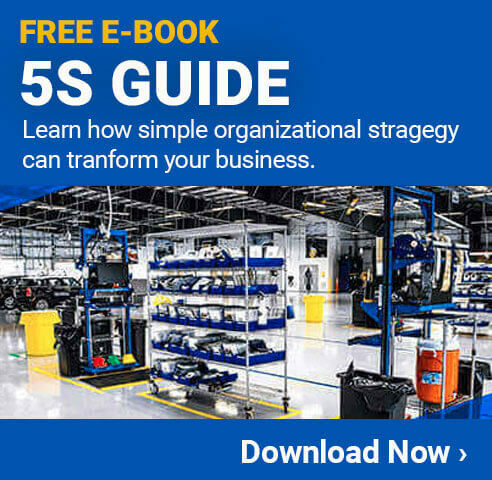 While this visual organization system has been adapted for use in many workplaces including warehouses, offices, and healthcare facilities, many manufacturing facilities continue to benefit from 5S. When combined with other Lean practices, 5S often proves especially useful. In a manufacturing facility where employees routinely need to use tools and obtain materials, 5S plays a significant role. Visual markings make it easier to obtain those tools/materials and return them to their storage locations after use. Visual cues such as floor markings (floor tape, floor shapes, signs, etc.) can also create boundaries around different areas such as those used for storing cleaning supplies, finished products, machinery, etc. In a fast-paced work environment, these markings can mean the difference between a messy workplace and an efficient one. Each employee in the manufacturing facility is taught which 5S tasks to perform as part of his or her daily work, and this makes the system sustainable over the long term. As with many other Lean strategies, the practice and implementation of 5S also features some common misconceptions. In other words, employees and staff often confuse or misconstrue certain information and tactics related to 5S. This is very common, but can have a direct negative impact on 5S efforts and results. The below statements are some common misconceptions associated with 5S. Because there are many misconceptions out there about the processes and tasks involved in 5S, it is important to not lose track of the basics. Misconception: Areas involved in 5S should be set up in ways those involved in the 5S process believe most suitable. Truth: Work areas should ALWAYS be set up and organized for those who will be actually using the areas. Misconception: 5S just means "throwing out expensive stuff" without rhyme or reason. Misconception: 5S is "just a tool." Truth: 5S is a tool, but it is not "just a tool." It is a comprehensive framework that emphasizes the use of a specific mindset and tools to create efficiency and value. Everything from organization to cleanliness is looked at. In addition, it also emphasizes the practice of being proactive versus reactive. Truth: Even though the practice of 5S is usually one of the most basic and one of the first Lean tools attempted by many businesses, that does not mean it is "easy." There are many steps that need to be taken before 5S is even considered. In addition, employee involvement is key. Employees need to "buy-in" and be willing to learn and participate as well. Misconception: Put up some safety signs and floor tape and you have implemented 5S. Misconception: 5s is just a Japanese way of beautifying things. Truth: 5S is not just a beautifying technique to make work areas simply look better. Instead, it is more of a problem-solving approach, which utilizes the help of various techniques and is a practical way to assist in increasing value. Misconception: 5S is all about cleaning; it is basically housekeeping on steroids. Truth: Cleaning is a very minuscule component of 5S. The practice of 5S is multifaceted and interweaves a mindset with a practical process to assist in creating both culture and discipline.